To protect the world oceans, ensure maritime security and develop the blue economy more and better capacities are needed. How can these capacities be built? How to organise maritime security? With what policies? When and how is external assistance the most effective? These were some of the core questions discussed at the SafeSeas Symposium held in Nairobi on the 2nd of March. At the heart of the event was a discussion of the guidance provided in the Best Practice Toolkit “Mastering Maritime Security”, which was launched at the event. 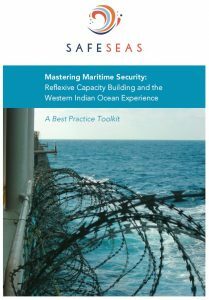 As the toolkit demonstrates maritime security can be enhanced through reflexive practice, by rethinking of how to organise maritime security nationally and internationally and rethinking some of the ways of how external assistance is delivered. The symposium provided a unique opportunity to rethink how maritime security governance can be organised and how the efficacy of capacity building and cooperation between donors and receivers can be improved. The high-level event brought together 60 participants representing Western Indian Ocean countries benefitting from capacity building, as well as representatives of organisations engaged in capacity building and a range of practitioners active in maritime security projects. The one-day event included a welcoming panel highlighting the importance of maritime security capacity building, followed by a discussion of the best practice toolkit “Mastering Maritime Security”. The afternoon programme zoomed in on dedicated practical challenges – fishery crime, maritime domain awareness and the delivery of capacity building – and concluded with a strategic debate on the future of international engagement in the Western Indian Ocean region (see the full programme including the list of speakers). The event took place under the Chatham House rule. In the following summary, all contributions that were not part of the formal presentations are non-attributed. Special Envoy Peter Thompson opened the day’s proceedings by stressing the importance of maritime security for achieving the Sustainable Development Goal for the Ocean (14), as well as its cross-cutting relevance to many of the other goals. He highlighted the important role of capacity building in assisting weaker states to achieve better maritime governance and greater protection of the oceans, and to effectively harness the benefits of a thriving blue economy. The Special Envoy strongly endorsed the SafeSeas project and highly commended the SafeSeas Best Practice Toolkit as marking a significant step towards improving the delivery of capacity building for maritime security. Mrs Karigithu welcomed the participants on behalf of the Government of Kenya and expressed the honour for her country to host the symposium. She stated that maritime security is central to assuring the sustainable development of the oceans in Kenya and elsewhere and stressed the importance of transnational cooperation. She emphasized that no single state could develop a comprehensive maritime security strategy overnight and the need for collaboration with other maritime nations and partners. She called for enhanced maritime domain awareness and broader collaboration to effectively respond to existing and emerging threats through a joint framework for enhanced situational awareness and security cooperation, adding that the symposium’s outputs would provide useful insights as well as shared experiences. H.E. Barry Faure thanked the SafeSeas team for producing the Best Practice Toolkit and discussed its relevance as a guide to Seychelles’ pursuit of maritime security. H.E. Faure stressed the necessarily collaborative nature of maritime security, providing Seychelles’ bilateral relationship with India regarding infrastructural developments on Assumption Island as an example of a successful, collaborative relationship. H.E. Faure discussed his country’s success in organising maritime security through the Seychelles Comprehensive Maritime Plan of Action, and the current experience of drafting a Maritime Security Strategy for the country. H.E. Veronique Lorenzo showcased the broad engagement of the European Union in maritime security capacity building in Somalia to date, discussing successes as well as some of the specific challenges posed by working in Somalia’s specific developmental and security contexts. Amb. Lorenzo described the extent of the problem posed by Somali piracy, not only to the international community, but also to the Federal Government of Somalia and to Somali society itself. Prof. Paul Jackson provided an introduction to the British Academy’s Sustainable Development Programme; the initiative that has provided funding for Safe Seas activities to date. He emphasised the importance of the Sustainable Development Goals and the need to drive these forward with the help of evidence and research. The welcome panel allowed for initial comments and questions from the audience and four themes were in particular discussed. Firstly it was discussed whether regional states are sufficiently well attuned to the economic promises of maritime security. Investment in maritime security can bring substantial returns. This needs to be foregrounded in the dialogue between the international community and regional countries. Economic opportunities of maritime security are often eclipsed by the scope of challenges perceived to face the region. Direct links between maritime security provision and revenues from the sea should be established, for instance, by funding law enforcement through fishing revenues. It was, secondly, highlighted that the recognition that priorities held by individual states in the region and by international partners are often in tension with one another. Different states naturally have different maritime priorities, and regional priorities are often not the same as international interests that bring capacity building resources to the region. Thirdly, the question of how capacity building efficacy can be analysed and progress by attributed to particular capacity building programmes. While some states have high levels of public scrutiny on such matters than others direction attribution is difficult, given the complex and cross-cutting nature of maritime issues, the plethora of different goals and interests being pursued by the diversity agencies and organisations involved, as well as the lack of or classification of data. Finally, the importance of strong leadership, both within and between states, as well as among international agencies and actors working on the ground was highlighted. In order to benefit from capacity building resources flowing into the region, recipient states require strong leadership that can foment a clear sense of purpose and direction. Seychelles was mentioned as a paradigmatic example in this context. Mr. Alan Cole highlighted the value of the Best Practice Toolkit, announcing that the UNODC’s Global Maritime Crime Programme is already using the document to run workshops on capacity building in the Philippines and Vietnam. He focused his comments on three issues raised in the toolkit that particularly corroborated his programme’s experiences: the need for capacity building to be steered and coordinated by receiving states; the need for effective processes of interoperability between different agencies involved in the provision of maritime security; and the need for careful reflection and analysis regarding the nature of the relationship between navies and coastguards in specific cases. Mr. Mohabeer praised the work of the SafeSeas project and emphasised the usefulness of the Best Practice Toolkit, before offering some general comments regarding opportunities and challenges posed by capacity building programmes in the region. In particular, Mr Mohabeer stressed the importance of recognising the degree of seablindness in many littoral states, and the constraints this placed on countries seeking to pursue the economic opportunities of maritime security and the blue economy. Mr. Agelou offered an appraisal of some of the core themes of the Best Practice Toolkit that spoke most directly to the experiences of EUCAP Somalia. Drawing on the toolkit’s discussion of seablindness, Mr Agelou argued that like Kenya, many of the maritime challenges faced by Somalia are exacerbated by its legacy of seablindness. He discussed the particular challenge that from the Somali perspective, piracy and maritime security are perhaps justifiably less significant concerns than land-based insecurities of the kind wrought by Al Shabaab. His presentation provided a visual account of the working context of EUCAP Somalia in coastal Somalia and some of the infrastructure currently under development. The audience welcomed the best practice toolkit and comments concerned in particular the role of politics in capacity building. The first theme discussed concerned the nature of the relationship between land- and maritime-based insecurities, and the different levels of prioritisation accorded to each in different state contexts. It was observed that the costs of addressing maritime challenges are often prohibitively high relative to land-based security measures, and that this often disincentivised poorer states from prioritising the maritime. In response, the importance of thinking the land and maritime dimensions of security holistically was highlighted. Several participants, secondly, highlighted the importance of the political process in establishing maritime security as a priority. Since capacity building is an inherently political and unavoidably normative endeavour, the political consequences of maritime security need to be at the forefront of our analyses and discussions. International partners also should be candid and open about the political interests and priorities that attract their resources to the region in the first place. Several state representatives used the discussion as an opportunity to provide an overview of their country’s experiences of capacity building to date. These reports provided mostly positive and optimistic accounts of the progress achieved to date and the scope of opportunities yet to be realised. It was clear from all such reports that effective and open collaboration between state agencies and international partners is deemed essential for future success. Mr. Savins discussed the work of the FAO Somalia team in the fishery sector and the changing security challenges their operations have faced. The work of the FAO has focused in particular on building livelihoods capacities, with a geographical focus on marginal communities and internally displaced persons in the Bosaso region. Mr Savins described the amendment of Somalia’s fisheries legal framework, including the establishment of a legal basis for a federal Somali fisheries authority, as a key success in recent years. He also provided details on the web-based Vessel Monitoring System (VMS) provided by the FAO to all Somali entities in 2017. Throughout he highlighted the importance of fishery regulation as one vital dimension of maritime security. Mr. Louys provided an overview of the economic and social importance of fisheries in Seychelles. He explained that underreporting remains a serious issue, and how other maritime threats are interconnected with and impact fisheries. Although Seychelles is often considered as a key success story of capacity building in the region, he suggested that the country faces several maritime threats and coordination challenges. It was stressed that failing to address maritime threats would have an impact on fisheries, consequently affecting the Seychelles both economically and socially. Discussing how these threats might be addressed, he argued for building awareness through educational programmes, improving ocean governance, developing institutional capacities and intensifying regional cooperation. Mr. Bergh outlined the work of Fish-i Africa Task Force and its role in addressing fishery crimes. Fish-i Africa is a cooperation that grew out of the 2008 Statement of Commitment on IUU fishing by the Southern African Development Community (SADC). The main objective is to address high levels of non-compliance and financial losses from illegal fishing, mainly perpetrated by foreign vessels in the tuna industry. As he showed throughout the presentation, fishery crimes are linked to various other crimes as well as human rights violations. A core challenge continues to be how to organise prosecutions for these complex and highly transnational crimes. Following the first of the more specific panels on challenges of maritime security, the discussion focused in particular on the transnational character of fishery crimes. Fishery crimes are transnational in nature and this poses specific problems when seeking justice and prosecutions. This for instance concerns knowing whether and when a crime took place. Often it is difficult to know where a fish was caught and the regulatory regimes of permits and controls appear limited and is often dependent on the reliability of flag states. Action can become more complicated if vessel ownership is unclear or fishery crimes are state sponsored. When vessels are captured, for example, it is often hard to determine who actually owns the vessel, due to the complexity of the fishery company’s structure. Again, without the requisite licensing structures in place within and between regional states, there is a greater dependence on trust that might be desirable in many cases. Mr Randrianantenaina provided an overview of the regional MDA project conducted under the MASE programme in Madagascar, the Regional Maritime Information Fusion Centre (RMIFC), describing the organisational structure of the programme and discussing some of the system’s strengths and challenges. He emphasised the inclusivity of the RMIFC approach and the critical importance of fomenting trust between different MDA programmes and the cultivation of a spirit of sharing if regional MDA systems are to prove and remain effective. Mr. Randrianantenaina also stressed the need to incorporate a combination of technology with low-tech sources of information, deriving for example from human resources. Mr. Micheni began with an overview of the key points of the Jeddah amendments to the Djibouti Code of Conduct before providing more detail regarding specific issue areas. He stressed the need to break down existing silos between navies and coastguards, and argued that regional partners need to take responsibility for the effective functioning of MDA centres in the region. Mr Micheni also flagged the upcoming DCoC meeting in Jeddah in May in which means of better integrating regional MDA will be discussed. Mr. Nattrass introduced the efforts undertaken under the Indian Ocean Regional Information Sharing and Incident Management Network (IORIS). He discussed how greater coordination between donors is required if the system is to function successfully and sustainably after the first two years of funding is over, but argued that solutions imposed from the outside often fail or are not adopted, for a number of reasons. Primarily, this happens when a lack of local ownership or consultation results in a system that does not meet actual needs and thus becomes unsustainable in the medium- to long-term. [Presentation Slides]. The following discussion took up the vital role of MDA in maritime security governance and how it could be strengthened. This firstly concerned the dangers of high-tech MDA solutions, linked to cyber-crime and data breaches and how current systems can be better protected. It was highlighted that the majority of MDA systems, do not host military-grade material and that there must be a balance struck between the need for security and the need for ease of use. Another discussion revolved around the importance of ‘picking low-hanging fruits’ first, by organising national-level frameworks and communication channels more effectively. Inter-governmental departments and agencies in many regional countries often fail to communicate and share information effectively, and this problem often exacerbates on a regional level where it is often unclear who the points of contact are. Several comments related to the need for greater and more effective coordination between donors and recipient countries: everyone likes to coordinate, but no one likes to be coordinated. It was emphasised that coordination is necessarily a two-way process; recipient countries must be able to refuse support when it does not align with their priorities, while donors must stop and ask what recipient states actually need. Mr Church provided an update on EU NAVFOR Atalanta’s regional political and military engagements, as well as its capacity building efforts in Somalia. He focused in particular on the spill-over effects of the Yemeni crisis into the maritime domain, which has led to a diminishing maritime security environment in the southern Red Sea and Bab El Mandeb straits. Faced with a dynamic threat environment, as illustrated by the partial resurgence of Somali piracy in 2017, Mr Church stressed the crucial importance that the mandates of capacity building programmes are able to adapt and evolve relative to changing events on the ground. Mr Hansen offered an overview of the cooperative relationship between the Danish and Kenyan navies. He focused in particular on the formal, process-based nature of the Danish navy’s engagement, which organised its conduct on the basis of a series of clear steps. These comprised an initial comprehensive needs assessment, followed by a review and lessons learned period, and a subsequent planning period prior to the instigation of a repeated cycle that might extend the relationship until 2022. Mr Hansen emphasised the fact that MDA is not a single agency affair, but requires consistent interagency cooperation, mutual trust and agreement. CDRE Wise offered a comprehensive account of the Combined Maritime Force experience, whose operational mandate of ‘find, fix, finish’ has focused in particular on the issues of counter-weapons, counter-narcotics, and counter-charcoal in the Western Indian Ocean. CDRE Wise made the point forcibly that it is not possible for one state or navy to tackle these issues alone, and that cooperation and collaboration between states and agencies are essential. He also emphasised the fact that effective MDA depends upon the low-tech contributions provided by motivated people, without whom maritime awareness and the sharing of useful information is impossible. Leadership of this MDA coordination effort is also fundamental to achieving success. The discussion centred on training, the link to the shipping industry, as well as the importance of liaison officers. The question of how international forces can contribute more to training regional maritime security forces in areas which include information sharing practice was emphasised. How regional maritime forces can gain the trust of the shipping industry and closely collaborate with it remains a particular ongoing challenge. Another theme raised concerned sea-riding agreements. Many navies already offer this opportunity. Given the cost and difficulties of building and maintaining independent platforms in the region, such agreements could form an important part of the training provision, particularly in Somalia. There was also a strong emphasis on the importance of regional liaison officers acting as linchpins in the transfer of responsibilities to regional information sharing centres. A final theme of the discussion concerned the issue of prosecution and the development of an effective legal finish, when international naval patrols like CMF apprehend and seize a weapons or narcotics cargo. It was acknowledged by one panel member that at present we are lacking an effective legal finish process in many cases, which needs to be established on a nation by nation basis and involve both ends of the chain, i.e. the national entity conducting the search and seize, and the littoral state whose waters the seizure takes place in. Without an effective legal finish in a majority of seizure cases, it was recognised that there is a limited deterrent effect on potential future perpetrators. Mr Salicath opened his speech by proposing that piracy should be thought of as an illness, and while we might have addressed its symptoms successfully, we have failed to treat the patient, which in this case is Somalia. He argued that we need to make it impossible to organise piracy in Somalia, and the only way to do this is to end the culture of impunity for the 25-26 piracy kingpins whose identities are well known to both Somali and international partners. Over time, our hope and expectation should be that Somali authorities take measures to foreclose possibilities for the successful organisation of piracy in Somalia. He also found it important to maintain the chain of prosecution for pirates, which was built up in the region when piracy was at its height. Mr Mohamud took this opportunity to thank international colleagues and naval operations that have come to Somalia’s assistance. With the EU’s operational mandate in the region ending soon, however, he warned that there are still no stable governance structures or frameworks in place between the Federal Government of Somalia and Federal Member States. Mr Mohamud stressed the fact that Somalia faces a considerable list of challenges that it cannot address simultaneously or alone, and that appropriate and carefully delineated prioritisations on the part of both Somali authorities and international partners are essential. Mr. McGuire argued that while most approaches to capacity building focus on the provision of hardware or training, the establishment of effective legal authorities needs to be prioritised in the first instance. When appropriate legal frameworks are not in place in the recipient state in question, all other capacity building efforts are likely to founder in the medium and long-terms. Mr McGuire went on to describe some success stories where legal assistance has been provided to West African states facing a piracy problem and other maritime security challenges similar to those experienced in the Western Indian Ocean region. 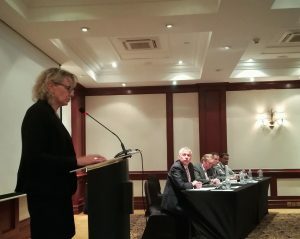 Ambassador Knudsen began her presentation by endorsing the work of SafeSeas and the Best Practice Toolkit, and explaining the importance of maritime security for the Danish economy. While acknowledging the success of the counter-piracy agenda in the Western Indian Ocean, she recognised that the root causes of piracy are still present and is thus in no doubt that the threat remains. Ambassador Knudsen went on to reflect on the diverse roles that different structures of coordination can play when faced with challenges in different contexts. She described the Danish model of having coast guard functions integrated within the navy as an illustrative example of a streamlined and cost-effective organisational structure that might be replicated elsewhere. The Ambassador also alluded to the fact that the region possesses other maritime capacities that might be able to play a useful role, such as the Eastern African Standby Force (EASF). In the roundtable and general discussion it was particular the question of prioritisation that was debated. The suggestion was made that given the scale of challenges faced by the Federal Government of Somalia at the present time, the government should perhaps be focusing on just the one or two top priorities – whatever these may be – rather than attempt to address a long list of challenges simultaneously. For one panel member, it appeared that the present Somali government faces a never-ending list of challenges. Owing to this, the key goal should be the installation and stabilisation of a functioning civil service that can effectively assist those ministers facing what sometimes appear to be insurmountable cross-cutting challenges. Without some degree of stability within the civil service, it remains unclear how any acting government could deal effectively with any of the issues at hand. One participant described the historical process whereby the Federal Government of Somalia and federal states collectively endorsed a Somali Maritime Resource and Security Strategy (SMRSS), which remains a key coordinating device between Somalia’s needs and donors’ resources that has survived throughout the terms of successive governments. Despite this, however, resourcing commitments to work on this list of perceived needs has remained a problem, and little meaningful work has taken place to date. In the end, according to more than one participant, this issue then comes back to the problem of a lack of political will. In spite of the best efforts of all actors and agencies involved, the question of funding and resources, therefore, remains a top priority for Somalia. A further set of questions revolved around jurisdictional challenges and the need for an effective legislative process to be in place in different countries to deter piracy and other maritime crimes. One panel member provided the example of Nigeria, which has enjoyed significant international support in developing its legislative processes relating to maritime crime, albeit with slow progress. One issue with providing assistance in this area from a donor’s perspective is that it does not readily lend itself to observable or measurable objective outcomes. One participant emphasised the strong legislative aspect of the DCoC Jeddah amendment, which requires signatory states to review their national maritime legislations. A number of interventions again stressed the central role that strong leadership should play if region as some agreement that actors need to work with less of a project-oriented approach, and rather more strategically, clearly stating to donors and implementing agencies precisely what they want and how and when specific programmes should be delivered. This commitment to a strong sense of local and regional ownership related to a broad consensus indicated by a number of comments regarding regional cooperation. In this context, it was proposed by more than one participant that capacity building will not work and in fact is likely to meet with local resistance in many cases if it is seen to be imposed from the outside. Relating this to the set of jurisdictional questions discussed above, it was proposed that the region might consider instigating a discussion regarding the establishment of a regional court of justice, to reflect the transnational nature of the crimes being addressed.